For the second time in just over a month a lightning strike in the Deep Gap community lead to a fire. On Tuesday, Deep Gap Fire responded to a reported strike involving a small tree at C Double F Farm Road. Jonathan Hodges, Public Information Officer for Deep Gap Fire, tells WataugaOnline.com the department investigated the tree that was struck and the area around it, no buildings or structures were in danger. The fire had almost extinguished itself by the time the fire department arrived, he adds. On June 14, the fire department also responded to a tree strike in the Ridgecrest neighborhood. In that situation the homeowner called 911 because of a concern of electrical wires near the tree that was struck. 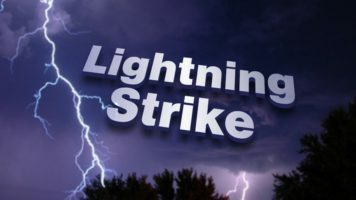 Both lightning strikes are the first local lightning strike reports by WataugaOnline.com in four years. On July 18, 2013 two local families sustained damage after an early evening storm passed through. On July 17, 2013 a tree on the grounds of Holy Cross Episcopal Church in Valle Crucis was struck, sending pieces into the graveyard and parking lot. In 2016 a lightning strike killed a 5-year-old boy from the Philadelphia vacationing on the Outer Banks. Two weeks prior to that a minister was killed on the Blue Ridge Parkway at the entrance to Mount Mitchell while motorcycling.